As my return to work draws nearer, I have started trying to take my mind off of leaving my babies all day every day and have started thinking about what I'm going to wear to the office. 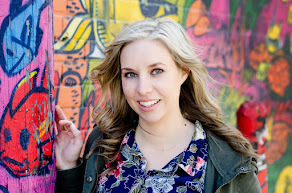 Naturally, I messaged my go-to fashion consultant, Deena (a fellow Blended Blogger), and asked what pieces I must have for the rest of the summer that are work appropriate. Deena, in all her fashion wisdom, told me to first go through my closet. I, being the slacker I am lately regarding anything that involves cleaning/organizing, have clearly not done this yet; however, I had a work meeting and was required to find something comfortable for warm weather (and a/c) as well as work appropriate. It would have been a wee bit ridiculous to go out and buy something to wear, so I took Deena's advice (you wise lady, you) and went through my closet. my legs look thinner than they are so thank YOU wedges!! I have been delaying putting my go-to red pants back on for fear they wouldn't fit. They not only fit but I didn't even rip a hole when sitting down. If that's not a post-baby win, I don't know what is. there's a lace detail on the collar of this shirt and the buttons have pearls on them. I like how my room appears clean. Really? I just kicked the laundry basket out of the way and put the end of the duvet so that it looked like I actually made my bed. Did I just defeat the of doing these things by telling you? Ah well. C'est la vie. I need to decorate my room. There's like nothing all the walls and it feels cold. Any takers? Deena, do you offer home styling advice? Carrie (Curly Crafty Mom) - you want in on this? One day I will again post a decent quality non-selfie pic... maybe. Can a blog go through a regression like kids do? Sorry folks. Okay next on my to-do, go through my closet, try on clothes (pray that they fit) and figure out some outfits for work... ya know, before I actually go back to work. One down... might need a few more. Alright, the Blended Blog is hosting it's weekly fashion linkup AND introducing a new series we're doing for the rest of the summer (read: July & August). We're keeping things pretty casual because everyone is busy so some people will be doing the outfits whenever they can. Little structure, lots of fun. It kinda reminds me of those choose your own ending stories from when I was a kid... only, in this circumstance there's no skipping ahead to possible outcomes so you make sure you choose the right one. Then again, royal blue, chambray and shorts would probably be all kinds of a hot mess... I digress, do it and enjoy. 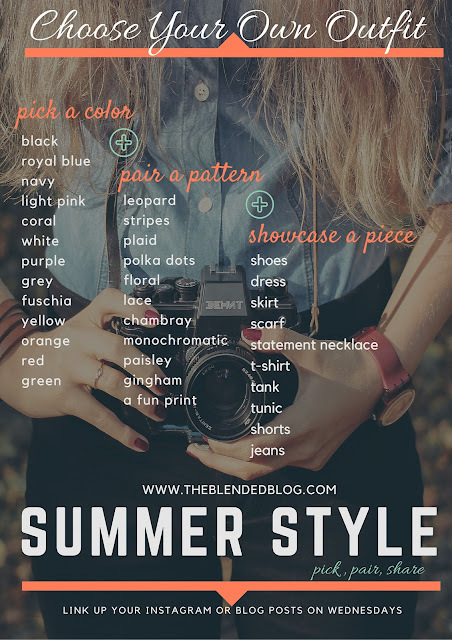 Feel free to join us and don't forget the hashtag #theblendedblogstyle if you're sharing on instagram or twitter!